Since I didn’t hear from 1PopstarPrincess, I drew a new number yesterday for the DiGiorno Giveaway. You can send a mailing address to me through the Contact Me form or reply to my email. Two $4 DiGiorno coupons, a hot pad holder, and magnet clip will be at your house soon! I’ve written about House Party events in the past in my Examiner.com column. This weekend, I held a DiGiorno House Party, which centered around three new products: Pizza and Wyngz, Pizza and Cookies, and Pizza and Breadsticks. I already mentioned that House Party and DiGiorno sent a lot of swag. I was able to get six packages of product for free. Since I could not find Pizza and Wyngz and we had leftover desserts from the previous night’s event, I focused on buying the new product Pizza and Breadsticks first, then other established products second (Classic Thin, Classic Flatbread, Cheese Stuffed, and Rising Crust). The conclusion? Everyone liked the product. The rising crust and breadsticks gathered so-so responses, but everything else we tried was consumed quickly and with enthusiasm. My family had never tried this brand of frozen pizza before. We quit buying frozen pizza a few years ago because of freezer space and concern for nutrition. The other family had enjoyed DiGiorno in the past. I think DiGiorno offers different products than what we would normally purchase. 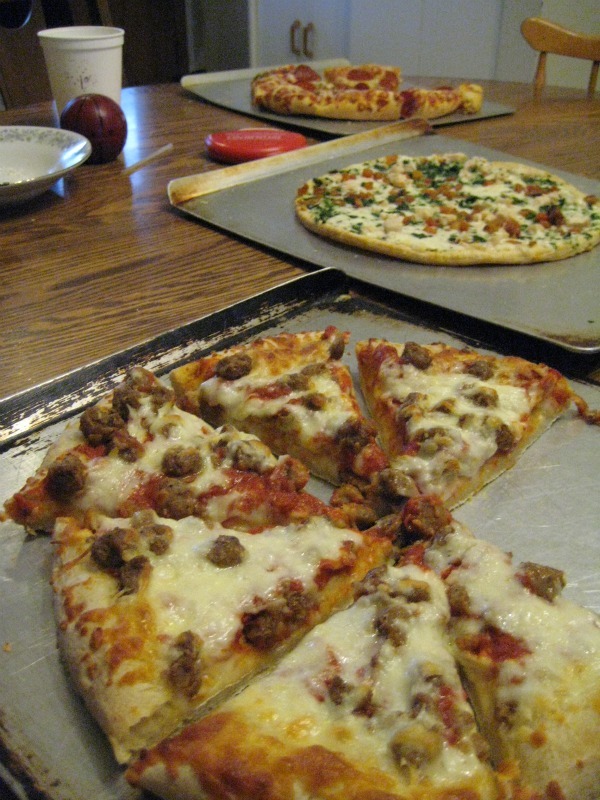 Grocers make their own, larger pizzas for a lower price, but with much less variety. This entry was posted in food and tagged giveaway, house party. Bookmark the permalink.